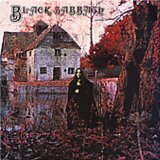 Dr. Rock's Blog & Roll: Album of the Day: Black Sabbath (2/13/70) 40 Years! Album of the Day: Black Sabbath (2/13/70) 40 Years! “Play me loud!” should have been painted across the cover of Black Sabbath, the eponymous first album by the band that achieved near-universal credit for introducing “heavy metal” music to the world. It was released in the U.K. on February 13, 1970 - a Friday, no less! - and three months later in the U.S. (Check out the Black Sabbath/Ozzy Osbourne playlist in Dr. Rock’s Playlist Vault). The monotonous rhythm of Ozzy and his bandmates’ macabre sound was best heard on a Victrola when played louder than anything our parents would approve of – louder than even the poppy, hand-holding Beatles’ songs from just a short six years earlier. Murky, dripping with occult imagery and morbid lyrics, Black Sabbath came with three individual tracks and two lengthy multi-song pieces oozing dark satanic themes and droning rhythms. “Kids, where are you?” was the question. “We’re in there, Mommy” the response. Dankly dungeonous, Black Sabbath had an auspicious debut for over a year on the US charts, peaking at #23 and selling a deadly million copies. Rolling Stone magazine ranked the album #241 on its list of the Top 500 albums of all-time.